I have been plowing my way through the immense wealth of Guinean music, which is the result of Graeme Counsel's efforts to retrieve what remains of the recordings at the national radio in Conakry, Guinée. And, as some have pointed out, of course the navigation at the site of the British Library is challenging, to put it politely. But what a treasure trove it is! There are updates and additions, confirming what we already knew, i.e. that the orchestras of the Sekou Touré era of Guinean music are rightly labelled as legendary. Take for example those live recordings of Balla et ses Balladins ("Keme Bourema", "Sara", - yet another - "Sara", "Soumbouyaya", "Diarabi", "Assa", "N'wato Barale" - a song which was previously only known in the version by Aboubacar Demba Camara and Bembeya Jazz -, "Autorail"), a brilliant new version of "Paulette" by the same orchestra, two fantastic versions of "Beni Barale" (here and here), of "Moi ça ma fout" (here and here) and of Rochereau's "Ruphine Missive" (serious competition to the original, if you ask me) by Aboubacar Demba Camara with Bembeya Jazz, out-of-this-world versions of "Air Guinée", "Kankan yarabi", "Bandian" and "Nadiaba" by Orchestre de la Paillote, paradigm shifters like "Commissariat" (a version of "Moi ça ma fout"), "Sabougnouma" and "Malisadio" by Orchestre de la Garde Républicaine, "Bafing bluese" (more tango than blues) and "Cherie kuma" by Bafing Jazz, and many, many atom bombs by Kebendo Jazz. Particularly this last orchestra has, as I have written before, remained one of the hidden treasures of Guinean music for too long. I have asked Graeme to see if he could find out why this orchestra, winner of the national orchestral competitions in 1962, 1963, 1964 and again in 1970 and 1972 (i.e. in 5 of the 11 orchestral competitions held in Guinée), was never given the status of national orchestra, but unfortunately no one seems to be able to give an answer. The mystery is accentuated even more by simply unbelievable songs like "Soumba" (the longer version I referred to in this earlier post), "Keme Bourema" (or "Toubabalou kaba", as it is titled in the catalogue), "Bebe", "Kakilambe"...... I just love the voice of Mamady Traoré. Besides confirming what we already knew, the collection offers an insight into the wealth of 'other orchestras', which were hardly or even not at all heard on the records of the Syliphone label. 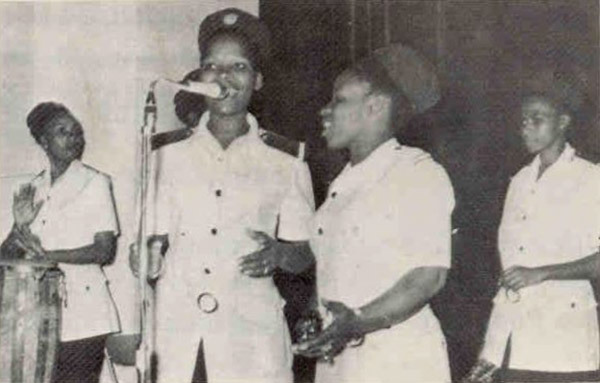 In the category "not at all" are Sasse Jazz, with this wonderful version of "Nankoura", Badiar Jazz, with "Air Guinée" to the tune of "El Manicero", and Fetore Jazz, with a slightly weird version of Kabasele's "Besame Mucho Jacqueline" titled "Esperanser". And that brings me to a point which struck me in the catalogue: the great number of covers of songs of the African Jazz side of Congolese music. Particularly Rochereau seems to have made a great impact on Guinean orchestras; his composition "Porti Caliente" is covered by Nimba Jazz, "Mokolo Nakokufa" by Kebendo Jazz, "Tuson" and "Maria Chantal" by Normalien Jazz and "Madina" by Koloun Jazz. Docteur Nico is covered by the Dirou Band ("Motema" = "Angele Ozali Wapi"), by the Djoli Band ("Nico 'sopela'" = "Boya Kobina"), Koloun Jazz ("Nakokoma", which is the correct title) and Kélétigui et ses Tambourinis ("Sukissa" = "Sukisa"). African Jazz's version of Miguel Matamoros' "El Que Siembra Su Maiz" has even been covered three times: by Simandou Jazz, by Kebendo Jazz and by Tomine Jazz. Franco's "Liwa Ya Wech" also gets covered a few times (by Camayenne Sofa and Orchestre de Kissidougou), but I guess this may have more to do with the fact that Miriam Makeba had a hit with it than with knowledge of the original. Kaloum Star bravely did attempt a version of "Azda". Les Bantous were apparently also known in Guinée, going by the covers of "Comité Bantou" by Kebendo Jazz and "Makambo Mibale" by Kebaly Jazz. 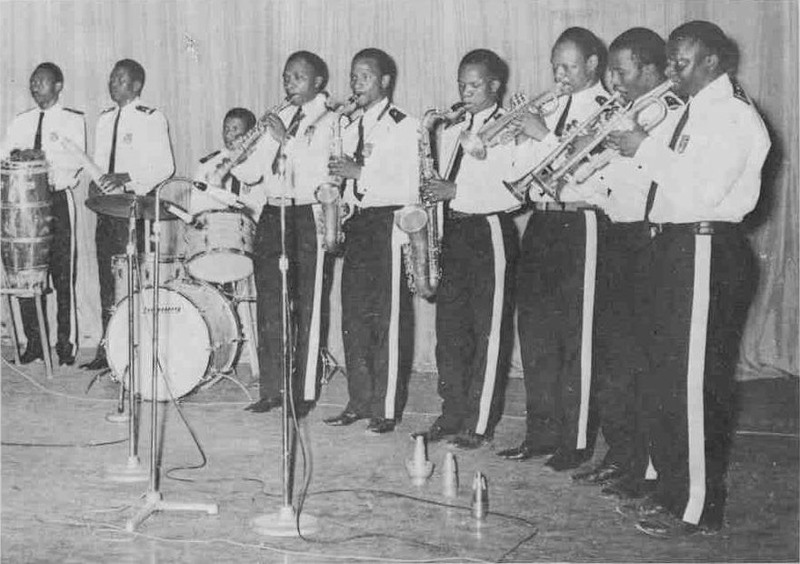 "Tambola Na Mokili", originally by Johnny Bokelo & Conga 68, was even covered by Bembeya Jazz (although this is a rather messy version, which has me doubting if it is by Bembeya), and the Forest Band had its own (great) version of Bokelo's "Mwambe". Finally, even Ryco Jazz has a version; "My Zainatou" was interpreted by Orchestre École Normale d'Instituteurs de Macenta. If you have visited the collection at the website of the British Library you have probably noticed that a large part of the collection consists of recordings by artists who have never released records on the Syliphone label, - not because they were neglected, but because they were of a later date. The last albums on the Syliphone label were released in 1980, although a few recordings followed, through Diapy Diawara's Bolibana records. Besides this 'post-Syli' category there is a remarkably large number of Fulani (or Peul) artists which have never been released on Syliphone. My guess is that the recordings in the BL collection represent less than 10 percent of all recordings of this category, and that most recordings were made and released on a local or regional (or even private) level. I strongly suspect that the cassette I would like to share with you in this post is of the latter category. I have been combing through the BL collection trying to find these songs, but it appears they are not in there. And the artists too have remained undetected. And that's a pity, because I have no idea who the artists are. The makers of this cassette have perhaps optimistically assumed that the listeners would recognise the great singers featured on their cassette. And I am sure there are many that actually do, - but not me. Fortunately the titles are mentioned, although not all. And I am not sure if I have correctly matched titles and songs. It doesn't take a great deal of study to determine that songs A1 to A4 are by the same artist; and it seems more than likely that the songs on side B are all by one, but a different, singer. The singer in the first four songs seems so confident within his music that he must be a (nationally / regionally / locally?) well-known star. I have been searching for more music in this rare style with the BL collection, but haven't discovered it (so far). In between these there is one song which is totally different, but seems to link the A and B side. My guess is that the singer is the same as the one on the other songs on the A-side. The accompaniment is very different from the other songs on the side. Guitar and kora have been exchanged for an obviously programmed rhythm-machine-slash-organ-slash-electronic-thingy. In this case the overall effect is quite pleasant, as it almost sounds like an accordion (and I like those..). This brings me to one of the major negatives that has come to light in the BL collection: the great orchestras of the past have - since the demise of Syliphone - in many cases been replaced by drum machines, organs and other generally irritating electronic devices. Besides this there seems to be a relatively strong tendency towards individualisation. In Guinée this trend seem much stronger than in 'related' countries such as Mali. I realise that this is related to the disappearance of public funding. But I can't help but feel that this has been amplified as a reaction to the strong control by the collective in the Sekou Touré era.... Hopefully the great collection in the British Library can contribute to breaking this trend, and to a re-emergence of those legendary Guinean orchestras. PS: Please note that a link to an archive of past podcasts has been added to the list of "Also recommended" sites. If we look at the special Boké accent, the Diakhanké accent, the singer of side A of the cassette, can not be other than Ibro Diabaté. The song "Tore" (in the BL collection / and not the one with the guitar) is on one of the cassettes recorded in 1987 from the RTG, as are some more songs. But none of these is even remotely like the songs on the cassette. @WrldServ:That Song Tere you mention me, is not by Ibro, the other yes. Ibro Diabate worked as a collaborator singing with any band on the country or solo, it was in 1992-3 when he managed to record with the producer Boncana Maiga and the musicians living in Paris, with this tape, Allah Nana he achieved fame. One of the songs in Allah Nana, was Gate. @Ngoni: It's a pity he has fallen in the hands of Boncana Maiga. I still have to discover the artist who has benefited from the 'conseils' of M. Maiga, - at least on an artistic level. WrldServ: The artist's life is not easy, the last(? )Ibro Diabate album is entitled 'Esclave de l'argent'. Thanks so much for the selection and your customary diligence in compiling it. Guinée jazz is a favourite of mine, and you have not disappointed. As usual with your downloads, they will lead me to further research and exploration, then purchase of more music. Happy listening indeed. The return of WrldSrv, great great post as always and nice discussion about the artists. Because of this just posting the referred Ibro Diabate K7 on my blog. PS: I didn't recognise Ibro from the '91 K7, but comparing the two NGONI seems correct, left over question: whose the singer of b4.Kolissokho on this K7? I am so so so so very happy to see the expanded podcast list. Thank you for making that available. I appreciate all the good things you share, but especially this. I have random podcasts on my hard drive, now I have been able to copy contents so I know what I am listening to! Thanks for the extra effort! Thank You ! Almost Ten Years of Awesome music. I love these Guinean posts. @Kobia Kobia: The music is really much older than ten years. And the blog is still only (a very young) 8. I am delighted to see WrldSrv back "broadcasting" once more. That the subject is a mystery K7 from Guinée only heightens interest, because between Guinée and Mali I would find it difficult to choose my favorite pop music of the continent. Immense thanks for pointing me to the British Library Syliphone archive. So much Kaloum Star, so little time! Amazing! Just wanted to say THANK YOU for this and all your other wonderful posts. I've been digging through the British Library trove and have been using some of your posts on Palm Jazz, Kebondo Jazz, and more to help beef up my own not-so-comprehensive knowledge. My favorite discovery so far is Super Kolima Jazz/aka Kolima Jazz, which I had been completely unaware of before, but who are just wonderful. After a four-year hiatus, I have revitalized my blog, Likembe. Please drop by! After more than 23 years of making radio programmes I am seeking new ways to share my passion for African and Latin music. My intentions are 100% non-commercial. If any post offends you please email me or report this in a comment.